"We're always connected, no matter how far apart we are." 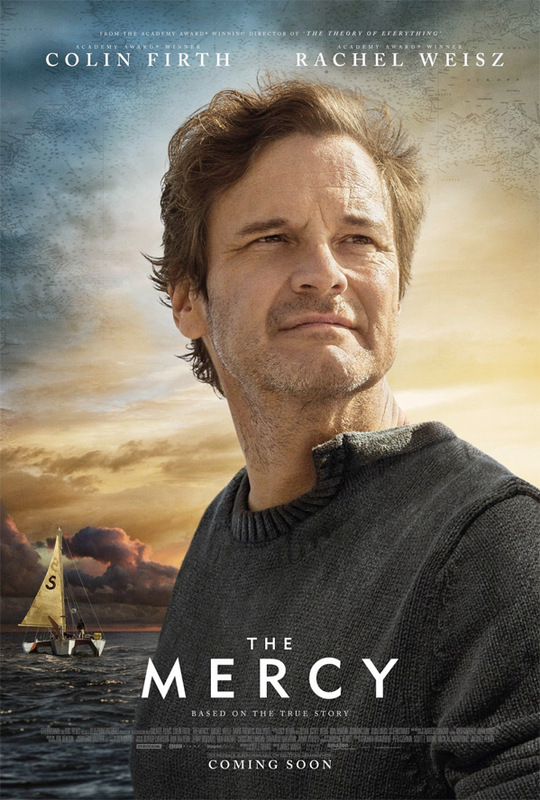 Screen Media Films has debuted a new official US trailer for the indie sailing drama The Mercy, which tells the story of a humble middle-aged man who takes an unfinished boat on a race around the world to add some adventure in his life. This already opened in Europe earlier this year, but is just getting a special theatrical US release in November (and on December 6th). This film tells the triumphant, inspiring, incredible true story of Donald Crowhurst, an amateur sailor who decided to take on the task of competing in the 1968 Golden Globe Race - sailing around the world solo. Colin Firth stars as Donald Crowhurts, along with Rachel Weisz as his wife Clare, plus David Thewlis, Jonathan Bailey, Tim Downie, Andrew Buchan, Genevieve Gaunt, Adrian Schiller. It still looks like your standard sailing survival, look-how-crazy-it-is adventure movie. Go live free, hang loose, all that. You can still watch the very first trailer for James Marsh's The Mercy here, or the other 60-second trailer. The incredible true story of Donald Crowhurst (Colin Firth), an amateur sailor who competed in the 1968 Sunday Times Golden Globe Race in the hope of becoming the first person in history to single-handedly circumnavigate the globe without stopping. With an unfinished boat and his business and house on the line, Donald leaves his wife, Clare (Rachel Weisz) and their children behind, hesitantly embarking on an adventure on his boat the Teignmouth Electron. The Mercy is directed by Oscar-winning English filmmaker James Marsh, of the various films/docs Wisconsin Death Trip, The Team, The King, Man on Wire, Project Nim, Shadow Dancer, and The Theory of Everything previously. The screenplay is by Scott Z. Burns. This first opened in the UK in February earlier this year, and most of Europe throughout spring. Screen Media Films will debut The Mercy in select US theaters starting November 30th this fall. Who's still interested?